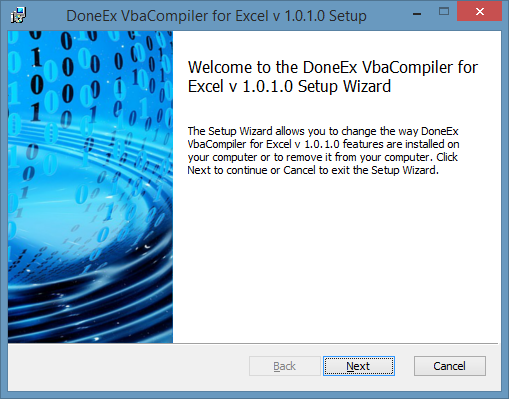 DoneEx VBA Compiler for Excel is the Excel VBA copy protection software that protects your VBA code in the most reliable way — by compiling VBA code into a Windows DLL. System requirements: Windows 7 or higher, Microsoft Excel 2007 SP3 or higher. After downloading you need to start VbaCompiler4Excel.msi file and follow to setup wizard instructions. Installer will install as VbaCompiler for Excel itself as MinGW GCC C compiler that works as back end compiler. Collection of examples compiled by DoneEx VbaCompiler for Excel. These examples demonstrate how the VbaCompiler for Excel works. After installing the examples, please find ‘VbaCompiler Examples’ icon on your Windows Desktop. The original Excel file is located in the root of each example folder. Newly created models with VBA code that are compiled into Windows native DLL files are located under the ‘Compiled’ folder. VBA project of each file is unlocked so you can see that compiled VBA code of each method is removed and substituted by a call of the DLL function. Copyright 2005-2019 © DoneEx LLC. All Rights Reserved.